I see so many cute photos on Pinterest of people setting up their own background at home for the various holidays. I thought to do my own for Valentine's Day and Oriental Trading had just the props I had in mind and when they arrived for review, I couldn't wait to start shooting. I've been a huge fan of paper lanterns but sadly never used them in the past because I didn't have a clue how I would hang them. Well, at home, it is perfectly easy as you just get some small eye screws and screw them right into the ceiling. Since our ladder is still at our rental condo, I had to climb on top of the dresser and screw these into the ceiling. It would have been a bit easier had I not overdone myself at my once a week gym class. After some huffing and puffing, I managed to screw 3 in and tied some fishing line to them. 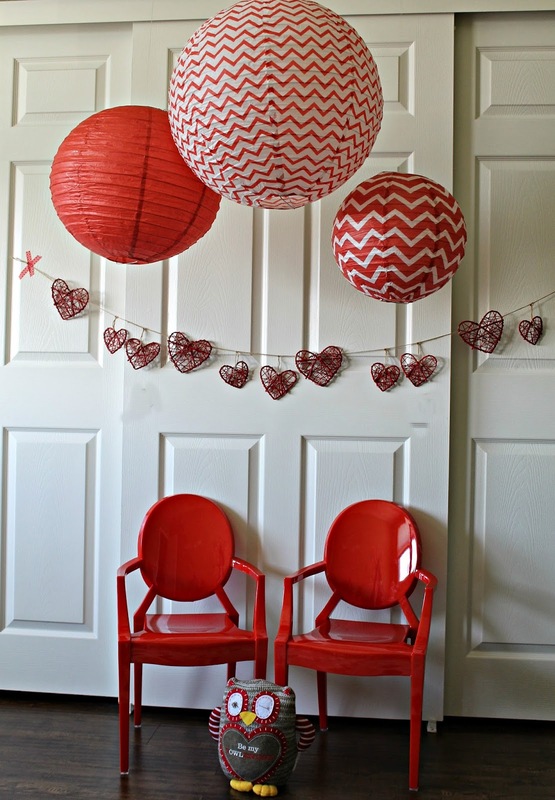 The red chevron lanterns ($8 for set of 3) are fantastic as you just need to open and insert the metal frame inside and they are ready to hang. Who knew how easy but statement making these were? I love garlands and the rattan hearts garland ($7.99) truly looks handmade and rustic. It was easy to hang with just a few pieces of Washi tape. The hearts are even movable on the jute if you wanted to change the spacing. The adorable touch is with the plush valentine owl ($7.99) who wants you to "Be my vOWLentine". This is sweet and a great Valentine's gift on its own as well. Let's just say that trying to get Mason to sit still and laugh/smile was a nightmare! He was too busy to bother with my photo shoot and ran off to play. Kenzie, on the other hand, was being a goofball. I guess these are the true photos to cherish and save in your albums. Life isn't picture perfect so just make sure to capture your children's special moments as they are. 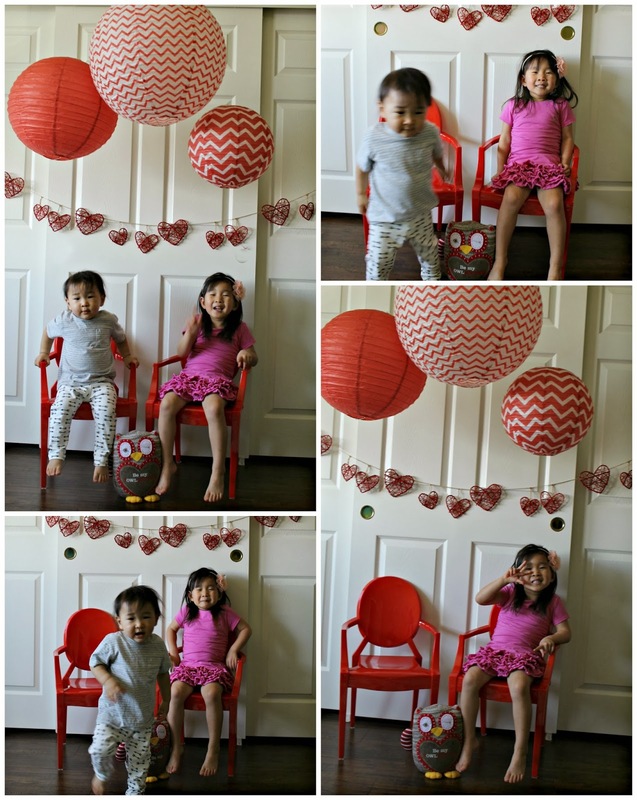 Check out all the fun photo shoot props from Oriental Trading because they are super affordable and can be re-used year after year! OMG great idea! I love Oriental Trading! i need to use them for stuff like this too! Where did you get those chairs? !